I notice that my last post four years ago in 2011 also discussed monarchs! I hope to have a more regular blog post about lots of habitat garden happenings from now on. 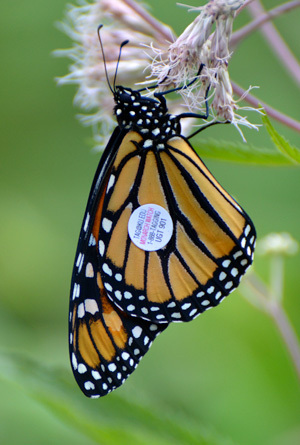 I just tagged our last monarch butterfly on Labor Day. Altogether we raised 55 monarchs this season -- not as many as in the past, but certainly more than the last two years when the population plummeted. We were lucky to even see monarchs at all those years. We hope this bodes well for the future population, though it still worries me that we're still not planting enough milkweed. The news about illegal deforestation in Mexico isn't good either. Though I find the tagging process somewhat stressful, I think it provides essential information about the migration that I hope will benefit conservation efforts. I'll be checking the list in the spring to see if they find one of "my" monarchs!